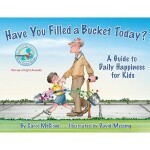 This past summer, I came across a children’s book which was new to me, Have You Filled A Bucket Today? by Carol McCloud. I immediately loved the concept the within the book and began to think about how we could use the analogy of “bucket fillers” and “bucket dippers” within our school. I decided to purchase a book for each primary class (we have 10 classes from gr. 1 -3) and a plastic bucket from the craft store, which I filled with shining pencils, stickers and a bag of goodies. I was determined to get into every primary class within the first week of school, read the story to the children, do a follow-up lesson with them, share the contents of the bucket and then leave them with the following writing task, “Today, I filled a bucket by….” They were to place their responses in the bucket, with the intent of sharing them with me during my subsequent visits. For those of you who can appreciate being in a large elementary school, with over 750 students, you can imagine what the first week of the school year entails. For me this year, the highlight of each day was looking forward to spending time in each of the those classes. The busyness of the office was just going to have to wait until I got back there. Fortunately I work with a tremendous administrative team, who capably held down the “fort” as I enjoyed sharing the book and spreading the message. On the second day of my “bucket -tour” as my secretary aptly named it, I was thrilled to hear one of our grade one students say, “Last night at the dinner table, my brother ( a grade three student who had heard the story the day before) said that I was filling his bucket by sharing the Wii game. Many of the classes have created large Thank You posters and they are displayed in my office. One class drew a large bucket and each student filled in a Post-it note with how I fill their buckets each day. When we meet as a Primary division at the end of the month, the classes will bring their buckets and we’ll share some of the stories. We will use the buckets throughout the year in a variety of other ways. 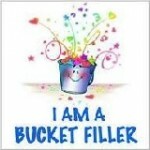 I’m hoping the students will be generating ways to use their buckets. As we are dealing with issues on the yard and in the classroom, we are asking students, “Are you filling someone’s bucket or being a bucket dipper?” Although I realize that simply reading a book and creating common terminology is not going to change the culture of a school over night, I believe that we are heading in the right direction. How are we filling the buckets of our students, our colleagues, our parent communities? My dad is a wealth of knowledge and he loves to share quotes and sayings as a way of contributing to conversations or when he is in the mood to give advice. One of his favourite sayings is “Always begin with the end in mind”. As we begin a new school year, I find myself putting things in place now that will make the year run smoothly and hopefully avoid those moments when we look at each other and wonder what the heck is going on. We’re scheduling times/dates/activities on a year long school calendar in order to avoid those inevitable conflicts that occur and we’re sharing with staff our expectations about routines and procedures so that everyone is on the same page. I’m making a commitment to spending quality time in classrooms with a focus for each walkthrough and starting that routine on day one, with the intention of maintaining it throughout the school year. But as I think about beginning with the end in mind for a classroom teacher, I wonder what that looks like? Our Ontario Curriculum states that by the end of each grade, the student will be able to…… So in essence we are starting with an end in mind. That end being the mastery of the chosen expectations. As we have been working our way through Teaching Learning Critical Pathways and Learning Cycles, we have started with a diagnostic task which is designed to include those learning goals that we want our students to have mastered by the end of the assessment period. But do we focus on that same premise when we think about our teaching practice. If we know that an inquiry-based model is the most effective way to have our students engaged intheir learning, do we start the year off that way? If we know that students need to communicate with each other in order to solidify their learning, do we start the year that way? Or do we have them quietly sit in rows and complete review sheets for the first little while and then slowly move them to a more collaborative learning formation? 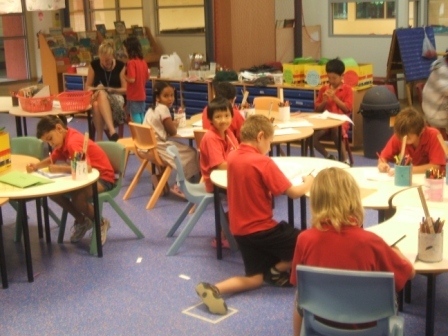 Although it’s much easier to produce the pages of review computations and the room is historically quiet while the students work their way through the questions, is that setting the tone for an active collaborative earning environment? Although it’s much easier to provide an assignment that will only require a mark out of 10 as a form of assessment instead of a good quality task with lots of opportunity for effective, constructive feedback, should we be starting the year that way? If our goal is to create a classroom where students are asking the questions that they want the answers to and researching, generating and presenting their findings, then why don’t we model that on day one? So my question for today is…. How are you starting your first day with your new class of students? Here we are on the eve of another exciting school year at Wilfrid Jury and I can’t help but wonder what the upcoming year will include for our students, our community and our staff. Last year we celebrated our 20th anniversary, we designed and build our Reading Garden, we beautified our front gardens, we hosted a Peace Tree workshop, we hosted the SWIS-London Official Launch, we piloted a number of technology projects, we installed more SMARTBoards and expanded our use of other technologies, we offered a variety of extra-curricular activities for our students and we continued to dominate at the Kiwanis Music Festival ~ just to mention a few noteworthy accomplishments. This year, we are thrilled to be welcoming 10 new staff members to our teaching/learning team and excited about their contributions to our school culture. We look forward to meeting and embracing all of the new families who have moved into our school community and our newest wolves, our JK students who will be coming to school for the first time, this September. One of our goals for the upcoming school year is to expand our forms of communication to ensure that we are sharing information with families in a timely and effective manner. 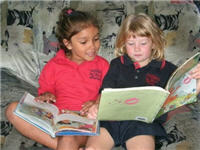 We currently develop a monthly newsletter, which is available online and most teachers send home a classroom newsletter. We are working with staff to encourage them to develop and maintain class websites and monthly I share thoughts and ideas in My Principal’s Blog. As a board, we are exploring the possibility of using Twitter and Facebook to share information. We will continue to keep you informed as these new forms of communication are being explored and piloted. 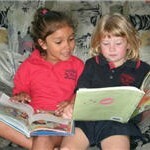 Please feel free to share your views about how we can better inform our school community. We are looking forward to making this year our best year ever! 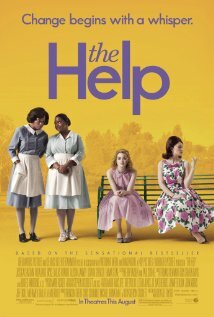 Recently I had the opportunity to go and see Tate Taylor’s, The Help, a movie which depicts an aspiring author’s decision to write a book about the lives of African American maids in 1960’s Mississippi. The movie was so inspiring and moving on a variety of levels and I found myself on a rollercoaster ride going from laughing out loud, to clenching my heart and dabbing with a Kleenex to dry my eyes. As the aspiring author gained the trust of the maids and as events in their own lives occurred, they started to share their stories which were both heart-warming and heart-wrenching. It was a true story about having the courage to share your story and the powerful impact such sharing can have ~ not only for the reader, but for the author and now, in the movie for the viewer. 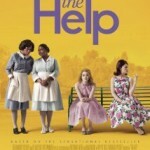 Very few will have left the theatre that night unmoved and profoundly touched by the story. Can someone say Academy Award? Although our own stories may not be as noteworthy as surviving the Civil Rights movement or changing history by putting pen to paper, they are important to us and as we found out so vividly in The Help, it’s important that we share those stories in some format. And in today’s world we have so many more vehicles for that expression. When I reflect on the stories that some of our students have to share I am reminded that their stories also run the continuum of going from heart-warming to heart-wrenching. Some of our students are able to articulate about going to Disneyland or about getting a new puppy. Others can share heart-wrenching stories about getting evicted or the death of a beloved family pet. We need to let our students know that there is great value in all of their stories and an even greater value in having the courage to share those stories. 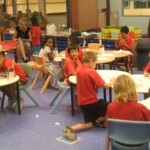 As teachers how do we create a culture where students freely share their life stories? How do we share our own stories in a way that will inspire our students to share their stories? How do we get our students to “dig deeper” when we ask them to write autobiographical information?